Umbrella-tree | Infonet Biovision Home. It's a large timber tree typical of rainforest from West and central Africa and reaching its natural eastern limit in the Kakamega forest. 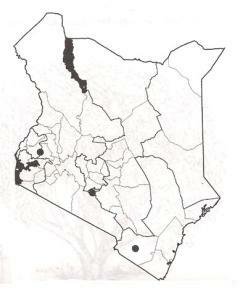 It is widely planted in wetter highland districts of western Kenya and north eastern Tanzania. Also grown in Taita Hills as a timber tree. Although the species can be intercropped, maize production is affected due to heavy shade as the trees grow bigger. Tree not resistant to fungi or termites and so rots quickly. Hornbills and chimpanzees eat the fruit and disperse the seed. It is internationally listed as an invader; so care with further spread is needed. Soil type: M. eminii is tolerant a wide range of site conditions but grows best on deep, moist and fertile sandy loam soils with a neutral to acid pH. Fodder: The leaves are used as fodder; digestibility of the leaves by livestock is excellent and only slightly reduced by heating. Fuel: Due to its fast growth, M. eminii is widely planted for firewood production. Fibre: it is sometimes cultivated for fibre production. Timber: The wood saws and machines easily, and its high absorbency makes it easy to treat with preservatives but difficult to finish. M. eminii wood is used in poles, boxes, crates, millwork, plywood, corestock and lumber construction. Medicine: A strong purgative and diuretic can be made by soaking the bark in cold water. The root bark may be beaten with clay and used to treat gonorrhoea. Shade or shelter: M. eminii has been successfully used as a shade tree for coffee in Uganda, cocoa in the Democratic Republic of Congo, and cardamom plantations in southern India and in home gardens for shade. Ornamental: M. eminii is a common ornamental planted along roads. 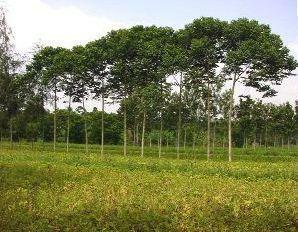 Reclamation: It is used for reforestation purposes, especially in Zaire. M. eminii's enemies include the cerambicid beetle Monohammus scabiosus, which excavates galleries into pole-sized stems, making the stem liable to snap off during high winds. Canker may form when the tree is attacked by a pathogenic complex of Fusarium solani and Volutella spp. Browsing animals can also do considerable damage to seedlings and saplings. In Uganda a canker, caused by Fusarium solani was described in young trees growing in poor soil.